For instance, how well do you think you know about how a bicycle works on a scale of 0-10 (where 0 is nothing and 10 is everything)? 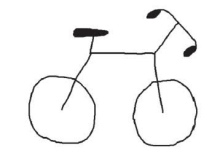 Having assessed your level of knowledge about bicycles, now complete the following sketch of a bicycle below adding pedals, chain and frame etc? 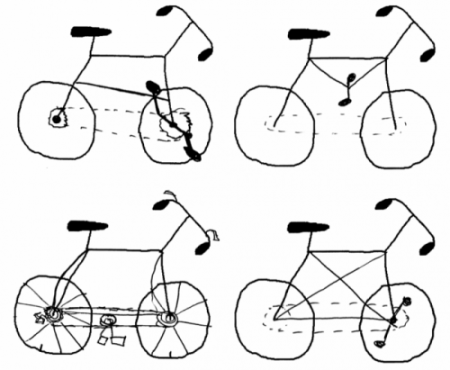 Now using your sketch can you now give a detailed and causal explanation of exactly how you think a bike works? Having prepared your sketch and your explanation, how well would you rate your understanding on a scale of 0-10 now? Most people, when faced with the above exercise, revise their score downwards as they realise they don’t know as much as they thought they did. See a few amusing examples of sketches below which illustrate the point. So we know less than we think we do, according to an excellent book The Knowledge Illusion, which inspired this post. The book includes the exercise above which was originally devised by cognitive scientist Rebecca Lawson. It shows that most knowledge actually resides with other people yet we usually fail to distinguish the knowledge inside our heads from the knowledge outside it. In fact the average brain holds only 1GB of data – a tiny amount! But our brains on not there to store data, rather to help us to act quickly and effectively. Therefore we only remember what they have to. What matters more than having actual knowledge is having access to it instead through other people, and increasingly enabled through tools such as the internet. So real intelligence is not a personal attribute, rather it emerges in groups that exhibit three qualities: i. evenness of turn taking, ii. social perceptiveness and iii % women participating. Smart communities are those that are well facilitated and where the people the most relevant expertise have sufficient incentive to participate. Here are three similar examples of smarter group decision making in action, from three very different perspectives, namely The Quakers, The Cold War and Google. In summary, we are all part of a community of knowledge whom we rely on entirely to operate, think and act. The paradox of smart groups is that in order to be truly effective, we first need to be more aware of our own ignorance, and then to open up to the intelligence of others.